When I was a teenager in Miami, my hair care consisted of drugstore brands like Aussie and Herbal Essence. I can still conjure the scent of those products. It’s practically Pavlovian: I get a whiff even remotely reminiscent of “botanical bliss” and I’m back to giant, crunchy diffused hair with stick straight bangs. Once, however, I was bestowed the luxury of a giant tub of Terax Crema. Back then, it was the holy grail of smooth, expensive-looking hair. The scent was more subtle but the results were obsession-worthy. So when I was recently sent samples of Terax’s newly formulated original, with sleek new packaging and infused with keratin, I was beyond excited to be reunited with my old hair care brand crush. It didn’t disappoint. I am in love with this conditioner. 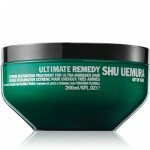 Armed with “smart” keratin technology, it deposits the healing protein where you need it most. And because of this super duper technology, it doesn’t wash out as easily as other brands do. If your hair is chemically treated or damaged, I think you’ll love it and see softer, shinier hair after your first wash.